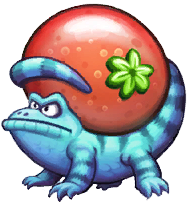 Bouncelisks are enemies seen in Donkey Kong Country: Tropical Freeze. They appear to be blue, striped lizards with long and coiling tails. They only appear in the Juicy Jungle area of the game. Bouncelisks carry red berries on their back. The Kongs can jump and bounce on the berry to gain a lot of height, enabling them reach and collect some items. When a Bouncelisk sees the Kongs, it will move towards them hastily, attempting to bump and injure them. However, Bouncelisks can can be stunned by hand slapping the ground near them, or can be defeated by attacking them with a roll attack or a barrel. ↑ von Esmarch, Nick, and Cory van Grier. Donkey Kong Country: Tropical Freeze Prima Official Game Guide. Page 12. This page was last edited on November 10, 2018, at 10:51.